In pursuit of better analog sound quality, TechDAS now introduces the next generation TechDAS Disc Stabilizer. Benefitting from the research and development onmaterial used to create TechDAS Air Force turntables, this new Disc Stabilizer Series II utilizes a carefully selected material having excellent sound characteristics to allow to eliminate the vibration on a record for a significant improvement of sound quality. Based on their expertise in material built through the development of the Air Force turntables, TechDAS team has raised the bars for better analog experiences. The Disc Stabilizer Series II employs A7075 super duralumin for the body, a material that has three times the hardness of normal aluminum and a quite high transmission speed as well as superb absorption of vibration, combined with the knob of non-magnetic stainless steel, which ensures a balanced performance of the entire stabilizer. This new model also serves to correct a warped record and quickly absorb and remove the micro vibration created on the record itself. The result is an incomparable sound quality. 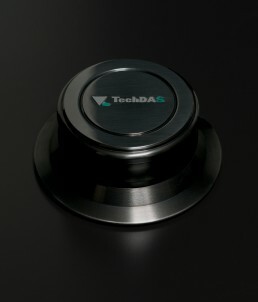 Unlike most disc stabilizers that rely on their mass to reduce the vibration on a record, which do not eliminate the vibration energy itself, TechDAS Disc Stabilizers can eliminate the micro vibration on the record using materials with top level vibration absorption as well as optimally simulated design.